Bardfilm: "Finally: A Funny Gravedigger!" L. A. Story. Dir. Mick Jackson. By Steve Martin. Perf. Steve Martin, Sarah Jessica Parker, Patrick Stewart, Rick Moranis, and Victoria Tennant. 1991. DVD. Artisan, 1999. When Poor Yorick was still around, its catalogue mentioned this film. Mistakenly thinking that the sentient, talking traffic sign quoted Shakespeare (it doesn't), I skimmed through it, became disappointed when I found no quotes from Shakespeare on the traffic sign, and took it back to the library. 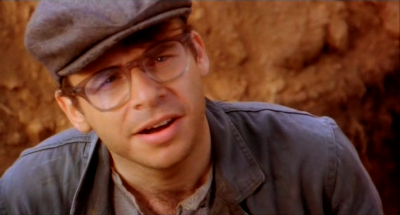 But I finally remembered—it's not the sign; it's Rick Moranis as the gravedigger! That's where the Shakespeare is in the film! Oh, and it's marvelous.